Summer 2018 Anime: What have you picked up? I suggest using AniChart to see what's airing with solid sorting and filtering options, if you aren't already into seasonal anime or just want to see what's going on! Banana Fish is one of my favorites so far, I hadn't heard of the manga before so I went in completely blind. Grand Blue Dreaming is everything I want from a comedy anime and more, I'm definitely going to keep up with that one. Hanebado, Cells at Work, and Asobi Asobase are all on my to-watch list as well. I haven't started anything quite yet because I've been distracted by other things, but I think to start out I'll be looking at Chio-chan no Tsuugakuro, Asobi Asobase, and possibly BANANA FISH. I assume I'll pick out some of the other slice of life or romance anime at some point since that tends to be what I gravitate toward when there aren't a bunch of things popping out to me, but we'll see. I've loved the first three episodes of Banana Fish. If the studio can maintain momentum throughout the whole season I think it'll be at least as popular as Yuri On Ice was. I'm not able to really watch or follow anything currebtly. When I get back I'm planning on looking at whatever the summer hotness was and what's been reviewed well. I'm probably going to skip Overlord III though, I read through some of the Light Novels and kind of lost interest. Banana Fish - Liking this one so far. Visual style reminds me of older anime relative to current trends. Hanebado! - Animation of the badminton is great. Can be a bit overly dramatic. Not as good as something like Haikyuu! !, but still entertaining. Hataraku Saibou - The stand out newcomer of the season for me. A mix of technical and accurate biological information, cute depictions and comedy, and gory battles (germs). Overlord III - I'm a big fan of the Overlord series, but this season feels like filler and has been disappointing for me so far. Based on discussion I've read, it seems to be based off of volume 8 of the manga, which they've said is mostly filler (side stories and Ainz daily life). Grand Blue - Comedy anime for me is always more miss than hit. 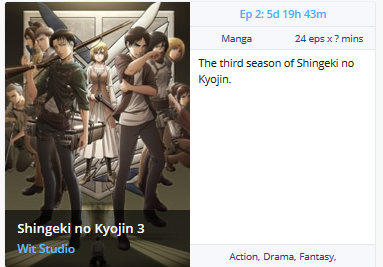 Attack on Titan / Shingeki no Kyojin Season 3 - I know the first ep is out, but I haven't gotten to see it yet. As a fan of Grand Blue manga, is the anime really disappointed? I haven't read the manga, so I can't comment on how similar in plot or style the anime is to the source. For the anime, I found the production value average at best and the comedy mostly frat/drinking/college humor (not meant as a comedic critique, just not my cup of tea for a full series). I haven't read the manga, but from what I've heard a lot of fans of the manga are really enjoying the anime so far. Tsukumogami Kashimasu — slice of life with tsukumogami during Tokugawa period; it started late, 3rd episode was outed yesterday; I like that rhythmic OP. Muhyo to Roji no Mahouritsu Soudan Jimusho — but this started very late — 1st episode was last week, so I dunno, looks a little like Mob Psycho 100.
and AoT also. I had also picked up Cells at work and Angels of death but have since been slacking behind on the new eps mainly because I seem to have lost interest in them. I was also planning on taking up Banana Fish but felt like I should wait for it to be dubbed into English after a few mins of watching the first ep.